Nick Morfitt, from all the way just over my fence, makes his own music & has plenty to say about that made other people. Loosehandlebars invited Nick to put his keyboard where his mouth is & contribute to whatever this thing is. So, another new voice around here, there’s always room for anyone with a passion for our music though it is getting noisier. By our Beatles correspondent Nick Morfitt. What was the projection for Paul McCartney as a solo performer circa 1970 ? For John, it was Janov, a conscious attempt to kill the dreamweaver in the name of artistic truth. George was finally getting a chance to air his own embarrassment of songwriting riches, half Krishna folk song cycle/half slightly put out Beatle digs, with an illustrious cast of Clapton ,Keltner, Gordon, Delaney & Bonnie etc etc. Both were working with Phil Spector at the controls- airless,stark minimalism for J, the patented Kitchen Sink soundorama for G. Ringo was about to take his own Sentimental Journey of trad ballads and music hall songs,while holding the pocket tight with Klaus Voorman on John and Yoko’s Plastic Ono debuts. So what the heck was Paul doing ? Hiding. 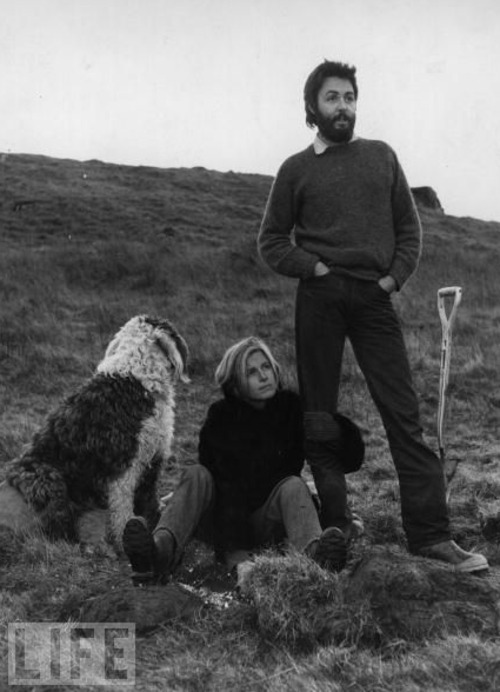 Newly located to the middle of no-wheres in Scotland with Linda and Heather in tow, Paul must have been feeling like the black sheep of the (ex) Beatles. Chided for his “Granny music”, berated for his attempts to lead the Fabs through the dying embers of the 60’s and the only Beatle not to have been charmed by Spector’s methods, resulting in legal action and complication. Speaking of legal action and complication…APPLE RECORDS ! To Paul it must have seemed like an Allen Klein assisted nightmare, a case of too many people. Britain’s very own Brian Wilson, the songwriter’s songwriter) had no gameplan, merely to head off into the heart of the country and take stock. Musically at this stage there was no sure-fire bet as to how the first solo McCartney material would develop. For all the seemingly in-offensive doodles like “Ob la di…”, “Maxwell’s”, “Honey Pie”, a rather mixed blessing of a stock in trade, Paul blasted out raw soul nuggets like “Oh Darling”, demented “Helter Skelter”, quietly un-nerving “Blackbird”…an eclecticism of variable quality could be expected at the very least then. Not that there’s anything wrong with that. Or home-recording late night with a nice supply of grass, doodling and rocking out your own one man band masterworks. It was the latter that formed the basis for Macca’s debut, finished off in more professional studios when Paul had decided that he rather liked these little bits and pieces. I’d argue that while McCartney is NOT an epic statement of artistic intent, it is more honest in intention than John or George’s debuts. Now I’m not saying “Plastic Ono Band” isn’t honest, it is,brutally so..but there is a slight pretence to proceedings. John’s primal scream concept suffers only because the writing is so superlative for a confessional, the music so perfectly crafted be it the “I Found Out” side or the “God” side. POB is a knowing masterpiece of self-confession couched in sensitive production ( a Spector surprise here), a definite statement. Yoko’s recorded in one day debut actually nails the Janov wail-like-the-cosmic-baby & be re-born idea more faithfully. These exploratory recordings were made after a year of soul searching and beard growing showing Paul with his guard down and having fun. The perceived McCartney indulgence is tempered by a definite sense of the bittersweet, the tweeness is always slightly stalked by shadow and that holds true for the willowy nature of the first three Paul/Wings LPs. Less of an album,more of a scrap book and it’s home recorded fidelity renders it akin to the soundworld of the Escher demos or the barest of “Let it Be”‘s endless rolling tape. For all his blockbuster songwriting qualities there’s only one perfect for mass stadium consumption & even then “Maybe I’m Amazed” appears as version that feels just short of a full song and is more affecting & effective for that. Opener “Lovely Linda” is pretty self-explanatory , typical of the offhand homely ditties that permeate the early Macca oeuvre and features a charming chair-squeak. For those who may want to ship out already..just listen to his acoustic guitar work. Then via a stoned giggle we jumpcut to the rustic and rootsy “That Would Be Something”, the song that was George’s fave moment. There are detours through vintage Beatledom (“Hot as Sun”), bluesy instrumentals, slightly uneasy ballads, field recordings(“Glasses”) & odd fragments of sound (the unfinished song “Suicide). After the rousing “Maybe…” the oddest moment on the album & perhaps its most mysterious, compelling moment “Kreen Akrore” is a surreal one man revisit of “The End” sonically inspired by a contemporary documentary about the tribe that everyone forgot. Linda’s worn angel vocals hang at the album’s fringes (& feel more integral to the music than Yoko’s yelps through “Live Peace In Toronto) they would become more defined later. “McCartney” is a definite new beginning, albeit one that defied expectations for all the “wrong” reasons.-It’s far from the slick mullet haired rockshow, the Macca tour machine evolved into ( those drums are distorted and what’s with Macca’s “Beatboxing” to accommodate this?). It’s only controversial element is the accompanying press release. Here in a faux interview, included to avoid inevitable press hoohah,Paul took ownership for the break up of the Beatles and by default announced to the world at large that the Fabs were no more. John was shocked at this uncharacteristic bold move and in the legendary Jan Wenner Rolling Stone interview made his distaste known. Hey, Paul had grown up too, his defiance was REAL (& real was key to John at that time)..as REAL sounding as the album was. One could be pretentious & say the album predates the lo-fi one man band overdubbed efforts that would become fashionable later (Beck’s “Mellow Gold”, that’s one), oh wait I did ! Macca’s debut album served to illustrate that his life wasn’t a bowl of cherries while offering him a suitable platform to spread his Wings and ram on into the 1970’s. Man, they were lonely but they weren’t hard pressed to find a smile. Over and out. I was looking for some fresh voices for my last post on The Everlasting Yeah’s current Pledge for “Anima Rising”, their upcoming LP (go on, click it). Around my computer I know Steve Pittaway to be a man of few words, all of them apposite & accurate. He was attending TEY’s gig at the Dirty Water Club in London on the 25th of July so I commissioned (Get Me !) a review if he would be so kind. Well…Steve is, praise Odin, a man who is passionate & effusive about things that matter to him. One of these things is the music made now & then by the members of The Everlasting Yeah. So could we have a warm hand on the entrance (oo-er !) of a new & welcome correspondent to loosehandlebars. “”Road trips to London from the Midlands for big city gigs were a regular thing in my teens & twenties. These treks started to diminish & now I’m in my forties they are almost non-existent. It takes a special band to get me back on the road on a Friday after a full week at work, knowing full well that there’s a long journey back up the M1 before the night’s end. A special band that are only on their fifth gig (We wont count the low key acoustic gig under a different name but, for the sake of one-upmanship, I was there !). I had already made an earlier trip to London, another to Oxford to see this band. So last Friday I was back on the road again. I should state that members of this band and I have a history. Our paths first crossed back in 1985 when, in a previous incarnation, That Petrol Emotion played at Warwick University. From that first gig I never saw them do a below par show. Petrol’s gigs were always exhilarating, life affirming, just what you want & need from live music. I was gutted when they called it a day back in 1994 (Even worse I could not make their last ever gig). One of the great things about the Internet is it can put you in touch with people from bands that you followed, whose music you collected. Back in 1999 I was able to hook up with one Raymond Gorman, guitar slinger with That Petrol Emotion. I learned that he was still making music and was willing to share it. I liked, no, loved what he sent me and offered words of encouragement when I could. I didn’t realise back then that it would take 15 more years for him to actually be in a position to release new material on CD/ Vinyl. Now that day is fast approaching. Excited much am I.
Raymond, along with former TPE band mates Ciaran McLaughlin, Damien O’Neill & Brendan Kelly re-incarnated as The Everlasting Yeah 2 years ago. From the outset a demo recorded in drummer Ciaran’s lounge made clear that this was a new band, one not content to trade on former glories, pushing things in a different direction. So here I am, Friday 25th of July in the Dirty Water Club, The Boston Arms, Tufnell Park, North London and that special band take to the stage. We are told from the off that what is about to happen is the band are going to perform all of the newly recorded LP “Anima Rising” in full, with a pause in the middle while the LP is turned over to side two! Bang !… side 1 track 1, “A Little Bit of Uh-Huh, A Whole Lot of Oh Yeah”, an earworm since I first heard it at that low key gig, setting the scene for what is to come. Duelling guitars, a locked in rhythm section, shared vocal duties mainly by Ray and Ciaran, the others chipping in when needed. I am one of the few lucky people to have heard Raymond’s early instrumental demo of the song. Back then it was a wild psychedelic guitar fest, now it is a sing along anthem one that engages from the off. Track 2 “Hoodlum Angels”, again a song given a good kick up it’s A since it was first demoed. There’s now more meat on those bones, Ciaran & Ray’s vocals mesh wonderfully together, Brendan’s bass line holds the whole groove, while Damien’s guitar phrases glides above it. “New Beat on Shakin’ Street”, chock full of hooks,an instant singalong. At this point I realise, as a drumstick splinters, that Ciaran is playing out of his skin. How he manages to put such intensity and passion into his drumming and vocals is beyond me. “Yeah Yeah Yeah”. Track 4 “Takin’ That Damn Train Again” a song built on a Krautrock foundation, the whole feel of the song one of built up frustration that spills out not only in the lyrics but the whole musical accompaniment . I for one cannot wait to hear the recorded version of this with Mr Terry Edwards on saxophone. Time to pause and flip the record. Side 2 Track 1, “Everything Is Beautiful”, is a song I first heard Ciaran doing solo (One day this man will release his singer/songwriter LP to the acclaim it deserves.). It is a change of pace in the set, slower than the other tunes. This full blooded version takes the song to another level; wonderful dual harmonies that raise my spirit. “All around the World” is new to me and it is during this song that I realise that this band is more than the sum of its parts. I cannot imagine that the band would sound the same if one member was to leave and be replaced (a good analogy would be the Bunnymen, did they ever really sound the same without Pete Defreitas?). Track 3, the 12 minute long “The Grind” rocked the Roundhouse at last year’s show and tonight is no different. This tour de force shows The Everlasting Yeah to be a fine tuned machine, their relentless energy spreads to fill the room. “Anima Rising” ends on these high notes. That Petrol Emotion’s encores were usually surprising & spectacular cover versions. This is a new band, things are going to be different. They decide to do a song that they have rehearsed just the once, a brave if a little mad move. Lots of nervous glances between band members but they carry it off..just about ! Big thanks to Steve for taking the time to share his passion about this special band. If you click here you can soon be in on the The Everlasting Yeah’s debut LP “Anima Rising” & that’s a good thing.